First Capital Realty (FCR-T) is accumulating buildings in Calgary’s Beltline district, just outside the downtown core, for potential future redevelopment into large, mixed-use projects. RENX has learned that during the past year or so First Capital, in joint ventures with Allied Properties REIT (AP-UN-T), has purchased three properties in the trendy inner-city community. * Five Roses Building – 731, 739 – 10th Avenue S.W. ; one storey, 20,864 square feet of gross leasable area, retail use, 100 per cent occupancy, $11.94-million purchase price. “We think the Beltline is the place to be in the next 20 years for mixed-use development,” says Huizinga. “We’re taking positions that offer decent holding income, but more importantly provide opportunities for future redevelopment. Huizinga says it’s premature to talk about any specific future plans for the sites. He says First Capital will continue to look for other similar properties in the Beltline either as joint ventures with Allied or on its own. Allied already has a significant presence along 10th Avenue in that district, owning several older buildings. Huizinga says Calgary’s downtown core is taken up with many office towers. The Beltline offers an opportunity to do plenty of infill and mixed-use development. “The demographics are better in the Beltline than they are downtown in our mind. They’re strong for residential plays and it’s, I think, a more walkable community,” he says. First Capital has developed a strong presence along and near the popular 17th Avenue strip. One of the properties in First Capital’s portfolio is Mount Royal West, a mixed-use development one block north of 17th Avenue. A three-storey building nearing completion will house an Urban Fare store at street level, a Canadian Tire store on the second level, and medical office use on the top level. Vancouver-based Bosa Properties‘ 34-storey residential tower, The Royal, is also being built on the site. City reconstruction of 17th Avenue is helping to make it more pedestrian-friendly. The avenue has plenty of retail as well as pubs and restaurants. “The thing that’s missing in our mind, and the thing we’re trying to promote more, is fashion-oriented uses and higher-end retail. Those are the kinds of uses that we’re promoting to steer the retail mix a bit away from a heavy proliferation of pubs and restaurants,” says Huizinga. “We lack a Robson Street (Vancouver) or a Sainte Catherine Street (Montreal) or a Bloor (Toronto) in Calgary. 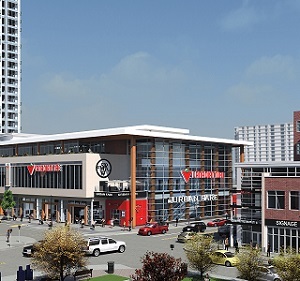 First Capital’s portfolio also includes the block between 8th and 7th Street along 16th Avenue S.W., which is home to the Mount Royal Village shopping centre and across from the Mount Royal West development on the east side of 8th Street. Huizinga says First Capital does have plans for the east side of that block adjacent to the Village “but those plans are retail-driven. “It’s the same sort of program as we envision east of Mount Royal Village and it’s been consistent with what the city has permitted along 17th Avenue. The city doesn’t want to see huge towers along 17th Avenue,” he says. The idea would be for retail at street level and some residential floors above. First Capital Realty is one of Canada’s largest owners, developers and managers of grocery-anchored, retail-focused urban properties. It currently owns interests in 161 properties, totalling approximately 25 million square feet of gross leasable area. During fiscal year 2017, the company reported its total portfolio occupancy increased 1.2 per cent to 96.1 per cent from 2016. First Capital invested $157.7 million in development and redevelopment during the year, acquired six properties and increased its interest in two existing properties for $287.2 million. It also disposed of interests in eight properties, three land parcels, and one surplus building for $90.1 million.